Our friend and neighbour Sue is always keen to promote events at the local church: this, you'll recall, is where she, her husband Peter, Linda and I have been involved in Hornet Moth surveys, Garden Bird Watches and several bio-blitz events: all good fun! 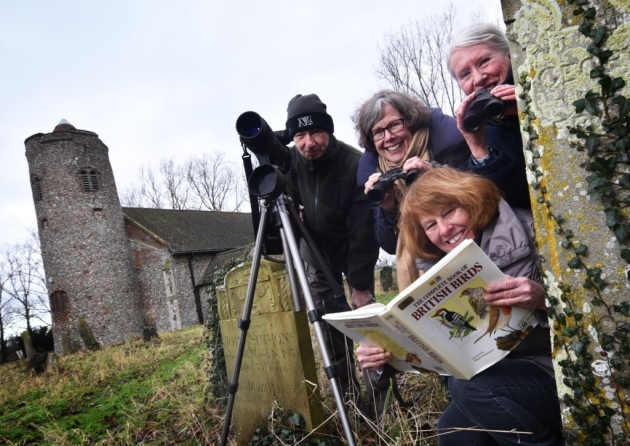 The other day Sue was contacted by a journalist from the EDP who wanted to write an illustrated feature about this year's birdwatch: I thought I'd share the result just to show the way in which non-birding journos often misrepresent anything to do with bird watching! The Friends of All Saints Church, Hemblington are hosting the annual Big Churchyard Bird Watch on Saturday, January 27th. This is the third year the event has been staged at the site as part of the Big Garden Birdwatch from the Royal Society for the Protections of Birds (RSPB). Last year around 500,000 people across the nation took part. 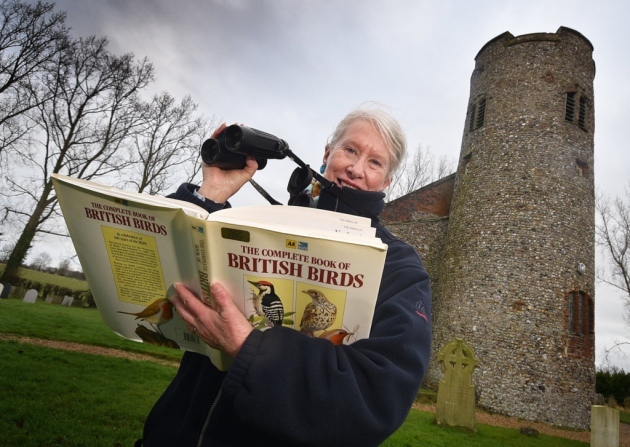 Susan Rowe, secretary of The Friends of All Saints Church, said: "The church’s location is quite high and isolated which means we get an interesting selection of birds. All are encouraged to come along and help us record how many birds we see each hour." She added: "It’s a good event for children – they get excited when the birds arrive." Since the last bird watch feeding stations have been placed around the church site, increasing the number of visiting birds. Local naturalist David Bryant will be on hand throughout the day to help with bird identification, while a selection of binoculars and telescopes are available for the public to use.